So yesterday at Disneyland I ran into the Baby Care Center. I have been to Disneyland a thousand times but I guess never had I with a baby. I wouldn't have given it a second thought unless I hadn't ran into it by accident when specifically looking for a Family Restroom for my mom (which was in the first aid center). I went in and there were two little candy-stripped old ladies smiling to greet me. They quickly welcomed me and pointed out where to change my son and I ventured in. I look back and laugh because only a theme park catered to dreams coming true would make such a place. 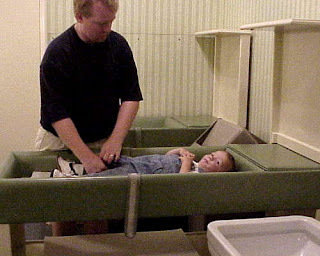 There were four little cushioned changing tables with sanitary papers to protect from germs and all that other gross stuff. Each one had it's own little headboard and shelving for convenience. It looked straight from a commercial in the fifties that was almost too good to be true. 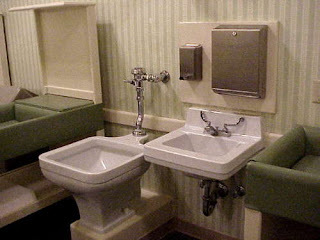 They had a dunking toilet for cloth diapers (another thing from the 50's) mid room with sinks and tiny little toilets and stalls. It was heaven sent comparative to the stainless changing tables in the restrooms around the park. They even had a quiet place to nurse your baby as well. Though I didn't take pictures myself, I found pictures from a guru of baby centers Adrienne Krock. Her website and more information about Disneyland's Baby center can be found at http://www.mouseplanet.com/. Needless to say I was pleasantly surprised and thought it was the greatest thing since sliced bread. If you have a baby or toddler remember to check it out. Even if you don't it's worth the smile knowing that so much thought went into a mindless task of usually us mothers. Just curious if anyone knows if California Adventure has one as well. After all, it's been a while since the picture perfect 1950's. Very cool. Even though I don't have a baby or toddlers any more I do have family members that do, and I will be sure to share this info with them. Hope you are having a fun time at Disney. And I thought BYU was the only place in the world where the bathrooms catered to diaper changing and nursing moms. That Walt Disney... he was one of a kind!! This is so great. I think not just the moms need this, but also the kids. I mean would you want to lay down on a cold metal table in an uninviting room? I just stumbled upon this and wanted to share; the Disneyland baby care center was designed by Walt Disney's wife, Lillian. It has been around for quite some time! California Adventure has one in the back of the park right next to Ghirardeli. That one is a bit more modern, but still a nice touch and includes the feeding, changing, and nursing areas as well as a little sitting area that has a tv and books.